There is no denying that the science and experimentation of coffee roasting are alive and well within the industry these days. The tinkering and optimizing remind me so much of the so-called maker movement. One of the most heralded terms being batted around these days is heating rate, or rate-of-rise as it’s commonly referred. Whether you prefer to call it the rate-of-rise/R-o-R/RoR, or our preference: the heating rate, understanding how quickly the temperature of the coffee beans rises and falls during roasting is arguably as useful if not more than recording bean temp by itself. Who would have guessed a little bit of simple high school calculus could be such a game changer? So, with all the attention it seems to be getting these days, we thought it was worth exploring this key RoastLog feature. Much of the buzz around heating rate is being generated by members of the roasting community. In fact, it’s difficult to attend a specialty coffee conference, Roasters Guild retreat or coffee roasting event without it coming up in discussion – and for good reason, as it’s proven its worth as an invaluable tool for guiding roast profile development and understanding the unique characteristics of one’s own roasting equipment. Understanding heating rate, merits some talk of tracking enviro air temp in addition to bean temperature on drum roasters. A few years back, we hosted a guest blog post about how the interplay between bean and air temp provided insights into the thermal dynamics of roasting equipment and helped roasters anticipate how quickly heat applied to the drum will translate to the beans. When we introduced our first 4-input data bridge we were finally able to equip our users with the logging device needed to simultaneously record both bean and air temps. Since the air in the drum is much more responsive to changes in airflow and gas pressure, the environmental air temp in the drum is a bellwether for heat transferring from the system into the beans. Adding in the heating rate/RoR completes the air temp/bean temp/heating rate trifecta, allowing roasters the ability to get realtime feedback on their flame adjustments and to see how rapidly bean temp changes during roasting. Heating rate as recorded in the iPad app. It’s worth reiterating that RoastLog users have the ability to visualize this information while actually roasting which, in turn, makes this info actionable. As a result, roasters gain yet another tool in the effort to get consistency and quality from their roasting operations. Knowledgable folks like Morten Münchow espouse the benefits of tracking the rate of temperature change when performing roast profile analysis and while dialing in roast profiles. In fact, one of the clearest explanations I’ve seen for heating rate/RoR – and the value of tracking it during roasting – is on Münchow’s blog at Coffee-Mind.com. However, he’s not alone amongst the evangelists. Profile analysis and development have become staples during coffee roaster trainings. Numerous coffee courses including, but not limited to, Coffee International, Boot Coffee Consulting and regular offerings from the Roaster’s Guild cover the topic. One need not go much further than Scott Rao’s book, The Coffee Roaster’s Companion, for what amounts to a clinical dissection of heating rate and it’s impact on roast development – one the main pillars of Rao’s Three Commandments of Roasting. Coffee roasters are increasingly using these types of tools to better understand and anticipate the progression of their roasts. With these tools comes control, clarity and a way to measure what previously was observed empirically. A perfect example is how heating rate informs roasters on how/when to adjust the application of heat to avoid pitfalls such as stalling and scorching. These were events that, not very long ago, were things that a roaster was more likely to sense than measure. More insight translates to better control and the ability to optimize the energy going into the roast. In turn, a new generation of roasters is emerging – many who are honing their skills and mastering a craft in an incredibly short period of time. We’re generating a vast body of knowledge around roasting that is systematically raising the bar on coffee quality. We’re just happy that we get to be a part of this movement. We’ve long promoted RoastLog as software designed for running your business. So while RoastLog is probably best known as a tool for developing and logging roast profiles and managing green coffee inventory, did you know RoastLog is used by many roasters as part of their air quality management program? Roasting coffee is fundamentally a combustion reaction and combustion by-products are created in the process, e.g., NOx, CO, CO2, SOx, formaldehydes and acetaldehydes, in addition to particulate matter, volatile organic compounds and organic acids¹. These emissions constitute air pollution. In the end, it’s all part of the reality of being a coffee roaster. Balancing the desire to help speciality coffee meet it’s full potential while still taking measures to minimize the carbon footprint of coffee roasting, is one of the many challenges we see our customers grappling with – especially in North America² and Europe³. Afterburner time/temp profile (green) logged simultaneously with roast profile. Then, there is the matter of ensuring that afterburners are functioning to specification. Moreover, many locales and municipalities mandate logging afterburner temperature as part of air quality management record keeping. For years, chart recorders have been the go-to for this purpose. RoastLog replaces conventional chart recorders in a reliable and automated fashion. Worrying about running out of chart recorder paper or discs – only to find out several roasts or even days later – are a thing of the past. 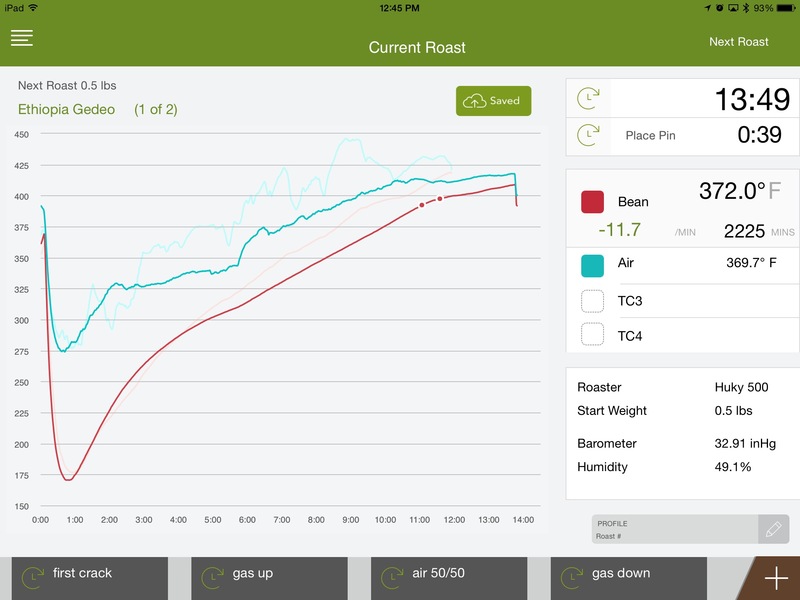 In RoastLog, afterburner temps are logged simultaneously with each roast, eliminating the need to manage chart recorder records separately from roast logs. Chart recorders can be costly to maintain, finicky and consequently expensive if they malfunction. It’s been reported that some air quality districts issue daily fines when there are no afterburner records. If you use RoastLog, and operate in an area that requires proof that afterburners are operational during roasting, the ability to log afterburner temp is built-in and can be added by simply installing a thermocouple. Duggan J. (2013, July/August). Smoke in the Air – An Update on Emissions and Air-Quality Regulations. Roast Magazine, 22-32. It’s official! RoastLog is now available for use with the Phidgets 4-input Temperature Sensor. This is something we wanted to do for quite awhile. 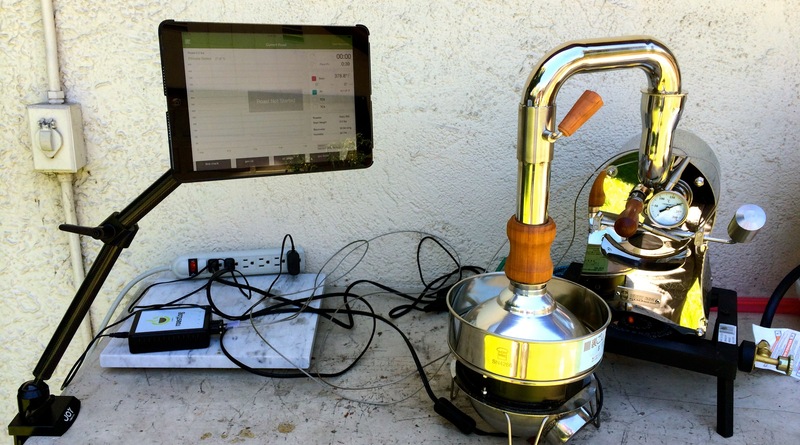 Compatibility with the Phidgets device simplifies the transition to RoastLog from other software systems and opens up an affordable option for home roasters who may have already invested in a data bridge and thermocouple(s). RoastLog was originally designed as a closed system utilizing our own hardware (initially, the 1st generation 1- & 4-input Data Bridges; and now, the 4-input Bluetooth device). After thoroughly testing the Phidgets, we feel confident in its performance. Moreover, the integration with RoastLog creates the same quality experience and reliability our users have come to rely on. We’re pleased to be able to provide another option to our users. For more details on connectivity with existing Phidgets temperature sensors, contact us. There are a lot of folks out there espousing various ‘Truths’ when it comes to coffee roasting, roast profiling and ‘the right way to roast’. As a mere part-time roaster, I’m not only unqualified to weigh in on this debate, but like most things coffee… I say, whatever floats your boat. That said, I have enjoyed and benefited from Scott Rao’s* perspectives on roasting. Awhile back I stumbled on his comments in an article over at dailycoffeenews.com and thought I’d share as it relates directly to a feature in our new RoastLogger app for iPads, the Roast Development Timer. Roast development time is not necessarily a new idea per se, but what I appreciated about Scott’s take was the notion of looking beyond the traditional view of roast development time. Simply considering the total time spent in the roast development phase alone seems to paint an incomplete picture. His idea takes into account the amount of time spent in roast development as a fraction of overall roast time. This makes sense to me, at least intuitively. Perhaps this is for the same reason that we thought our users would like to have a way to quantify the amount of energy introduced during their roast. The concept we coined as roast energy seems to follow the same logic. But is it reasonable to generalize an ideal amount of time (20-25%) as Scott suggests? 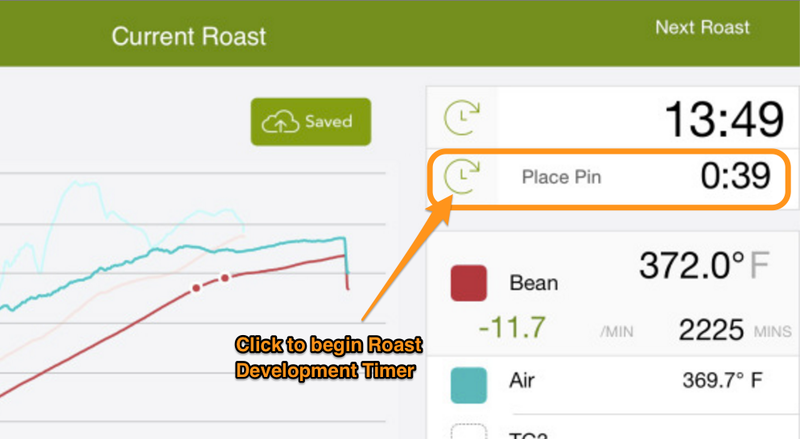 The Roast Development Timer found in the RoastLogger iPad app. It goes without saying, a lot goes into pulling off a good roast. How important is the roast development phase in your roasting? As a RoastLog user, would displaying the percentage be helpful? We try our best to be conscientious about complicating our user interface. Would we be muddying our UI by adding this or would it be insightful? *Scott Rao is author of multiple books about coffee roasting, brewing/preparation and offers consulting services. His most recently published book, “The Coffee Roaster’s Companion” includes a compilation of his observations, ideas and experiences roasting coffee. 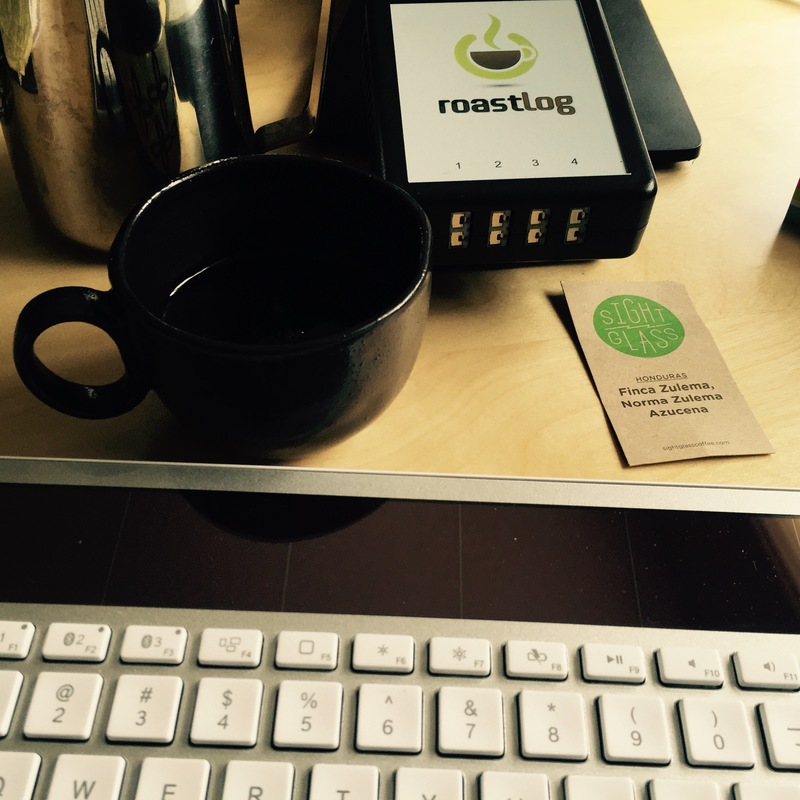 If you’ve been considering RoastLog for awhile and needed a little nudge, here’s your chance. In recognition of all the efforts to bring amazing sustainable coffee to the masses, and to celebrate International Coffee Day, we’re offering two free months of RoastLog** to all new subscribers. Tweet us a photo of what coffee you are enjoying today #NationalCoffeeDay and mention us (@RoastLog) on Twitter. It’s that easy. Today is International Coffee Day. We’ll take every excuse, ahem, opportunity to celebrate the beverage we love. You can bet there is going to be a lot of free or discounted cups of coffee served today, but beyond taking a moment to enjoy this beloved drink, please join us in raising awareness around the social and environmental issues related to coffee. Here are just a few examples of our coffee industry friends using coffee to do good! Love it!